Matt Manalo is an artist based in Houston, Texas. He followed a traditional path of education, immigrated to the US, pursed a medical degree, but ultimately pursued his passion: art. A mixed media artist, Matt finds inspiration though every day pieces, structures (built & destroyed), and his immigrant experience. With his community of artists and curators, Matt's work has grown and been exhibited in cities like Dallas, Washington DC, and Los Angeles. 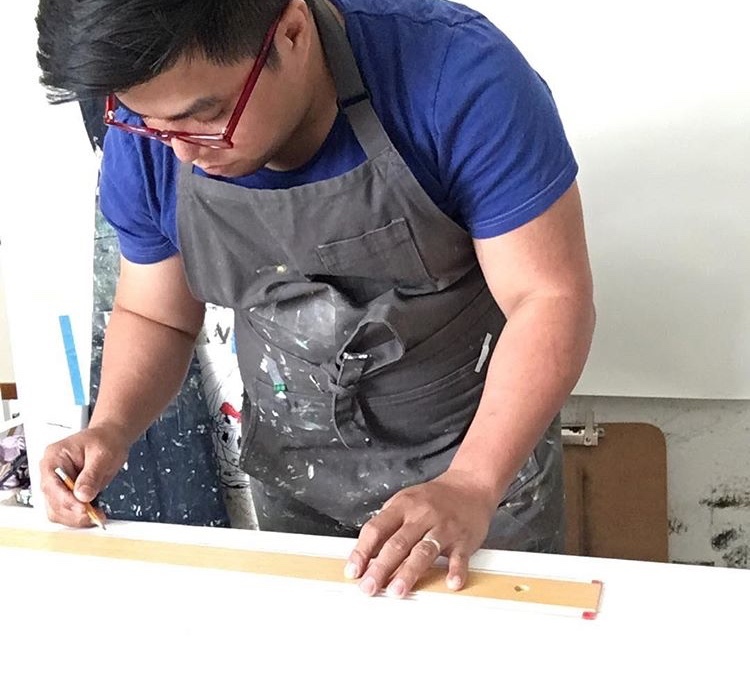 He is currently making wood block prints for his text based work and has exhibits in the Lawndale Art Center, in Los Angeles, and in Arizona. How did you create your career and have you always wanted to be an artist? I was born and raised in the Philippines. I’ve always drawn, joined art competitions, and was always generally interested in anything visual. My first interests in drawing came from Saturday cartoons and comic books. Growing up in the Philippines, I never thought of being an artist as my profession. I have always thought that the artists I’ve known just made art on the side as a hobby. I was already doing three years of college as a computer engineering major at Don Bosco when in 2004, my family and I immigrated to the United States. I struggled with accepting my new life and I didn’t have a sense of purpose nor direction. I decided to pursue a degree in the medical field because that’s what most of my Filipino friends were doing. After two years, I realized that no matter what I did, I couldn’t find passion in it and I couldn’t see myself working inside the hospital for hours to witness so much trauma, suffering, and death. So, I thought really hard about it. I knew that wasn’t willing to pursue anything I had no passion for. Art. It has always been art. Everything changed after that. I sat down with my parents telling them that I didn’t want to waste anymore money and time. I wanted to pursue art. I could tell my mom was worried for me and asked what careers I could have/do with my degree. “Teaching”, I always told her. I believe it gave her more peace. My parents being an electrical engineer and a teacher, I thought that they wouldn’t support my decision but they did. I can’t blame them for being worried. I took my basic art classes at Houston Community College. I figured, I could save some money and get all the basics out of the way. At the same time, I also decided to work as a studio manager/clerk for the art department. There, I’ve met practicing artists who also taught as a profession. I always asked questions regarding their processes and influences. I also started working as a “ghost painter” for a company, which was a very odd thing since I was basically painting landscapes, abstract, flowers, cityscapes, figures, etc. Then after taking almost all of the art classes like printmaking, photography, ceramics, digital art, and so on, I got my associates degree in art and transferred to University of Houston to get my bachelor’s degree in fine arts in painting. I quit my job as a clerk and studio manager and applied to be part of the install team and security at the Blaffer Museum. On top of that, I was also writing for the university’s paper. At this point, I was already making my personal work and has already participated in group shows. Everything seemed to have fallen into place and it gave me more courage to keep pushing. I graduated in 2011 with my bachelor’s degree with a minor in art history, a couple of residencies, and a big name collector. Since then, I have been working towards making stronger work, a consistent art practice, and being more involved in the art world. It has helped me greatly getting the support from my wife, the kids, and family. 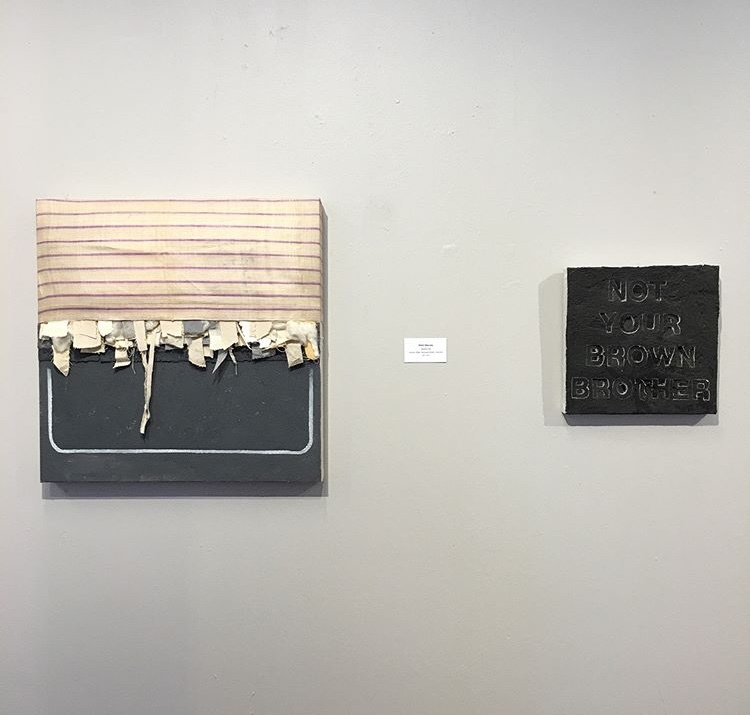 I work in mixed media: reclaimed objects, textile, raw canvas, paper, inks, wood, raw cotton, concrete, charcoal, acrylic paint, spray paint, oil paint, etc. basically almost anything I can get my hands on. Growing up, I went to a school which had a technical curriculum so I’ve always been interested in working with my hands and getting them involved. I like putting together things rather than just painting. As a result, my work looks more sculptural rather than just moving paint around on canvas. I’m influenced by everyday things like weathered walls, painted-over graffiti, cloth draped over scaffolds at a construction site, things stuck in-between things, visually peculiar choices our society have made to achieve a certain aesthetic, rocks stacked on top of each other… I could list more. I have always been interested in structures, of how things are built or destroyed especially of things I have found everywhere growing up in Manila and here in United States. How have your life experiences affect the art you create? Does your art bridge your life in the Philippines and in the US? The art that I create works as an ongoing journal of my experiences being an immigrant. The repetitiveness of some of my work’s process discusses the back and forth yearning or reconnecting of my past to my current life. I also include some words in my work and they’re statements I have used or modified to convey a certain idea regarding stereotypes on Filipinos. My creative process include reading/researching about the Philippine history involving the US and its pre-colonial times, history regarding activism by people of color in the US, and dystopian/futuristic writings in comic books. I involve myself in community-building especially with Filipino artists. I also consider walking and thrifting as part of my creative process it helps me visualize or do mental work-outs regarding processes or compositions. From that also comes collecting/hoarding of materials which I find useful in making work. Some of my friends also give me some materials which they feel I could use. What are some favorite exhibits that you have been a part of? For me, its all about community, community, community! My favorite exhibits which I have been a part of has been at places like the Oak Cliff Cultural Center in Dallas, Project Row Houses in Houston, Nous Tous Gallery in LA, and WAS Gallery in Washington. From all of those shows, I have met and built strong relationships with other artists and curators. 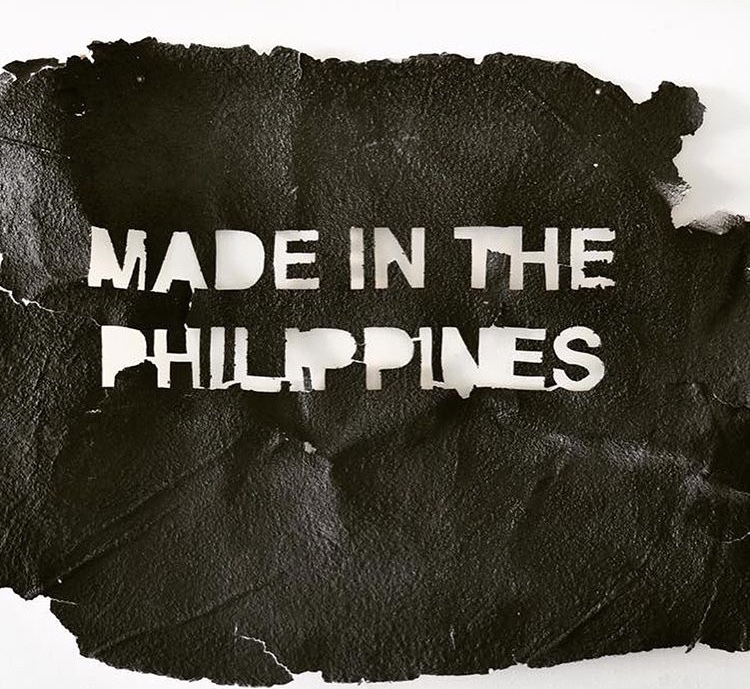 You are part of the Filipino American Artist Directory and worked with Pilipinx American Library, how has the Filipino American artist community uplifted you? The Filipino American artist community has been great to me and I am so honored to be part of them. Meeting curators, writers, musicians, collectors, and artists with the same heritage has been so refreshing. From when I started I always felt like I was alone in the art world because most of my friends weren’t interested in art so I couldn’t be involved myself in other conversations I cannot relate to. Being a part of FAAD and PAL gave me a sense of belonging —knowing that there is a community of people like me, who look like me, who didn’t go for the usual Filipino profession. We need to be seen and representation matters most especially in today’s political climate. Do you have any pieces or projects coming out soon? Yes, I am currently working on making a series of woodblock prints featuring my text-based work. My work was recently juried to be included for the Big Show, an annual art show displaying local artists at the Lawndale Art Center. I am also having a solo show in California coming October this year and a group show with Grit Collective in Arizona.